Wildlife Crossings - Road mortality has significantly impacted a number of prominent species in the United States and elsewhere, including white-tailed deer, Florida panthers, and black bears. According to a study made in 2005, nearly 1.5 million traffic accidents involving deer occur each year in the United States that cause an estimated $1.1 billion in vehicle damage. In addition, species that are unable to migrate across roads to reach resources such as food, shelter and mates experiences reduced reproductive and survival rates. 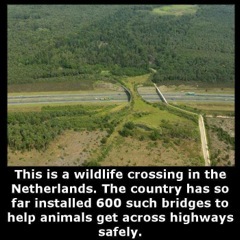 In the United States, thousands of wildlife crossings have been built in the past 30 years, including culverts, bridges, and overpasses. These have been used to protect Mountain Goats in Montana, Spotted Salamanders in Massachusetts, Bighorn Sheep in Colorado, Desert Tortoises in California, and endangered Florida Panthers in Florida. (Source: amusingplanet.com) Get more info on their website. Manatees - In 1991 when surveys began in Florida on the West Indian Manatees, there were only about 1,267 that could be found. The population has now increased 500% to 6,300 and 13,000 overall. So, the U.S. Fish and Wildlife Service proposed a down-listing status of the manatees from endangered to threatened for the Endangered Species Act. Federal commitments will stay in place for protection that will allow the population full recovery. The protection measures that had been put in place on federal levels, Florida, Puerto Rico and industries established over 50 manatee protection areas which have played a big role in reversing the decline. Read more about this good news. Tidbit - Cancer - Can you imagine cancer treatment being as easy as a monthly shot in the arm? In Texas, doctors are doing human trials on a "cancer vaccine" that converts a deadly disease into a chronic one, allowing patients to live longer. There's no need for chemotherapy, but allows cancer to be treated like high blood pressure or diabetes. Read more about this. Recent Visits - We have begun to see the Common Grackles which means they're making their way back up north. Fortunately it's not the huge flocks we get at some point which are so loud you can hardly concentrate. Last year they began coming through February 18. Yesterday I heard the Red-winged Blackbird singing his song. We had a first-time visit of one doing it last year also ... maybe the same one. Only stayed about a week. We didn't have any girlie to respond. That was on April 17. This one February 29. I keep saying Spring is coming early. 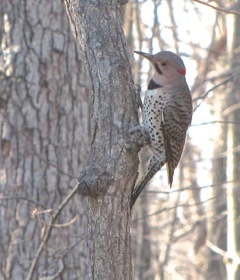 Woodpeckers - The Northern Flicker is a medium-sized member of the woodpecker family. 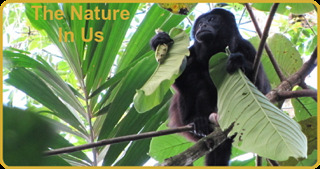 We've had very frequent visits from the male and female during the past two months. Do you have these birds visiting your feeders or habitat? I always like to know if a bird is a female or male. I notice some difference in their personalities and ways of life. Woodpeckers are much easier to determine male or female than many birds such as the Tufted Titmouse and the Black-capped Chickadee. 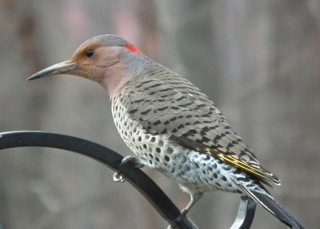 The Northern Flicker is part of the woodpecker family so it is usually included on woodpecker lists. The difference between male and female for them is the addition of a black mustache for the male. The female has nothing in that area of the face as you will notice the difference in the pictures shown. On Male Pileated Woodpeckers the difference is the red mustache stripe. The Female Pileated Woodpecker has a black stripe. The Red-bellied Woodpecker really does have a red area on its belly, but it's rarely seen. The Male Red-bellied Woodpecker has a red head from nape to beak. The Female Red-bellied Woodpecker has a red nape but it's not all the way to the crown. Isn't it interesting how the whole red thing plays into woodpeckers? The Red-headed Woodpecker is another one that doesn't show any distinguishing features different from each other. The Female and Male Downy Woodpeckers are identified with the female having a black and white head and the male having a red area on the head. The photo link shows the male feeding the female during mating season. The Hairy Woodpecker is very similar to the Downy but can be identified through the length of its beak. It is much longer than the Downy .. almost as wide as its head. The Female Hairy doesn't have any color on her head, but the Male Hairy has some red near the nape of its neck and there's a prominent black bar extending onto upper chest from shoulder on both of them. Tidbit - Christian & Muslim Peace - Faced with the threat of terrorist attacks in West Africa, Muslims and Christians have each other’s back. The worshipers are protecting every place of prayer, no matter religion. On Fridays in Cameroon, Christians guard the mosques as Muslims pray. Muslims return the favor by protecting churches during Sunday services. Peace is anywhere you choose to put it. Read the rest of the story. Spiritual - Home and Friends - I came across a picture of a print by Nathan Greene that I instantly resonated with. When you've got multiple health issues you can certainly feel like a sheep that has lost your way. Jesus is our Shepherd and I've recently had deeper revelation on that and it's been so wonderful to imagine Him as my Shepherd and when I lose my way, He leaves the 99 and comes after me. I especially liked the black sheep since I was not what you would call a compliant child. Very independent, strong-willed and would take a spanking rather than give in. Yet Jesus loved me through those times and now I see how deep and wide His unconditional and extravagant love is. So I purchased the print and found the same picture on a puzzle at Amazon. WOW! It was a challenge as a puzzle, but many of you know that we love to do puzzles and winter time is when that happens. I'm keeping on the one end of the dining room table to enjoy, even though the print is right across the bedroom when I'm lying in bed. I have an appreciation for art but have never been a collector of such things. I have an artistic friend in Texas that does all kinds of artsy things like making jewelry, crocheting scarves and even the new mermaid blankets ... and the list goes on. She has a website (www.CreativeExpressions.com), so you can take a look. I recently ordered a gorgeous scarf for a friend that wears scarves all the time. She does beautiful work! There are days when I think more about heaven than I do earthly life ... but this picture reminds me that Jesus' hand is only an inch away from pulling me out of this disease pit. The brambles and thorns may be pressing but I'm coming up. I love the clothes that Jesus is wearing. A shepherd and yet clothing of royalty. You can see the richness of it in the larger image. And the royal colors of deep blue and burgundy. I will not drown in the river of disease that threatens to sweep me away. During one of my journaling days of what I thought the Lord was telling me, I heard Him say, "You're almost there." I had a moment of comfort with that, but of course I wondered, "Was that You, Lord?" So I asked for a confirmation. God knows our frailties and loves us so much, so he'll give it, but you must closely focus on seeing it every day until you do. A couple days later I looked up at the picture and the thought instantly came, "Look at His hand. It's only an inch from the sheep. You're almost there." WOW! I just cry when I think about how much our Father cares for us to be involved in all the details of our lives. Then that afternoon another friend in Texas was writing a few words of encouragement. It turned out to be a confirmation of what God spoke to me. You know when you hear God, the devil will try to steal those words from you. "Did He really say .....? Those were thoughts from your own head." I always ask God to confirm it to me in some way and then I keep an attentive eye and ear out to notice when He does so. 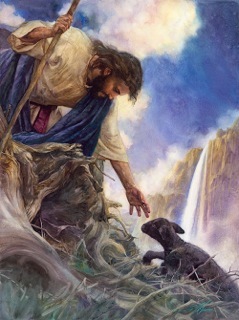 My friend wrote: "He has his hand reaching out for the struggling lamb ... you're not alone, I'm here. The road is rough, the climb is hard, don't give up, keep believing. Take My hand...things are about to change." There it was. I treasure the print, but I treasure what God has given me in friends and relationships. Without the interaction of the Body of Christ with each other we are lost. Tidbit - Homeless - After spending a day of living it rough on Dublin's streets experiencing life as the homeless do, Emily Duffy came up with an idea to raise money for a charity that helps them. The 15-year-old Desmond College student came up with an invention and called it "Duffily Bags. " These bags which are used to sleep in have a highly reflective, fire retardant and waterproof shell with Velcro straps allowing the user to get in and out. The bags are now being produced by former homeless people now earning $10 an hour. Read the whole story and watch the video. 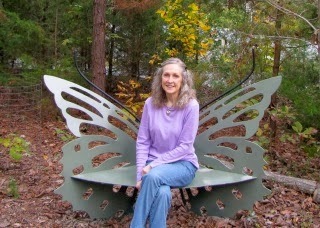 This might be a great project for a ladies day at church or a youth group. 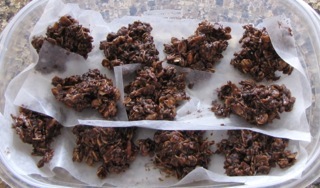 Recipe - Carob Clusters - My neighbor across the street offered to make me anything I want and can send a recipe for. That was so sweet! Before her husband died, we used to enjoy many dinners over there, lots of laughs, and good fellowship. They were the first people we met when we moved into this house in Virginia. With my greatly limited sodium diet, I can't think of any actual "meal" that she could do. My meals are a sandwich plate of various items from opening containers with things like date & coconut rolls, baby peppers, no salt blue corn chips, yogurt cheese, etc. etc. Sometimes it's a bowl meal which would be rice, or oatmeal or corn grits or pasta. Keeping my protein up is the challenge and I don't think I ever come close to the number of calories I should be eating, but that's okay. I was hungry for a biscuit recipe I used now and then that uses oil and is easy to mix without rolling the dough out. It has chopped onions and caraway seeds. With my no-sodium baking powder they can be made a no-sodium meal. That was the first thing I had her make, but as Valentine's Day rolled along I was thinking of a sweet treat and one of the things I would make when we had Benjamin growing up was Carob Clusters. Have had it since 1978 which was the first time I made it. Since you drop them on wax paper and chill them in refrigerator so they're a bit more chewy, it's easy to tear one off at a time from the wax paper. I got off of chocolate in Nov. 1998, but Valentine's Day still makes me think of chocolate. I don't crave it or think about it, but it's like Valentine's Day isn't the day without something that tastes like chocolate, so that would require something carob. Enter the recipe for Carob Clusters. I thought I'd share it with you in case any of you is interest in a "legal treat" for any holiday or no holiday. I call sugar an "illegal food" since I was so addicted to it when I was on chocolate. I always say that if somebody makes me something that has sugar in it that it's legal because it was made with love ... and love covers all! Drop onto wax paper and chill. Take a moment right now to think of somebody that needs a good deed. It will benefit you even more than them. It's soon daffodil time. I love to share our flowers with others. They will remind them that somebody loves them as they enjoy the flowers for days. We never know how people are doing on the INSIDE. Many times we manage our lives rather well on the OUTSIDE, but inside we are really hurting. May You Be Super Blessed in March! Make Easter a Special Celebration! It's not about the Easter Bunny or baby chicks.